It’s now commonplace for canceled series to come back to life via reboots and revivals, but several beloved dramas are going big for their returns: feature-length films. The cast of Downton Abbey just wrapped a big-screen version, a Breaking Bad film is starting production (still TBD: whether it will live on TV or in theaters), and shooting has commenced on an HBO movie of its Western drama Deadwood. And while AMC’s The Walking Dead continues without Rick Grimes (Andrew Lincoln), who last appeared on the November 4 episode, the character returns in a series of — you guessed it — movies. The announcement came moments after Andrew Lincoln's last appearance as Rick on the zombie-apocalypse show. What’s sparking this trend? The wish to satisfy the hunger of diehard fans, says Scott M. Gimple, chief content officer of the Walking Dead universe. "There’s this desire of the audience to see more of the world, so it’s interesting to start telling stories to answer those questions," he says. Here’s some intel on these high-profile projects. Lincoln’s final installment contained many surprises, the biggest being that Rick didn’t end up as walker food. Presumed dead by his fellow survivors after he was caught in an explosion, the severely injured hero was actually flown to parts unknown by a mysterious helicopter. AMC soon announced plans to expand the franchise into films, specials and digital content starting with a Rick-centric movie. "The Walking Dead is the mother ship, and we’re very proud of what it does," Gimple says. "Now, we want to do something different, something that complements it." The upcoming projects will stay true to their undead origins — "we won’t have any dragons or robots," Gimple jokes — and take viewers not just forward in the overall story but backward as well. "We absolutely want to go back to favorite characters and tell stories from their past, see how they wound up where they were and even explore things they’ve alluded to." Negan (Jeffrey Dean Morgan), Michonne (Danai Gurira) and long-gone but memorable characters like the Governor (David Morrissey) and Glenn (Steven Yeun) are all potential subjects, Gimple says. Plus, he adds, "we want to do a few things that are completely unconnected, with characters we’ve never seen before." The first Rick movie goes into production early next year with Lincoln at its center and a Gimple script. He teases that the fan favorite’s journey will unfold "in different ways we haven’t seen before that go along with the new situation Rick finds himself in." "And…we’re off." So posted star Michelle Dockery (Lady Mary) on Instagram September 10, when shooting began on the film version of the 2010–15 British period drama. Written by series creator Julian Fellowes, the project reunites the aristocratic Crawley family and its lively downstairs staff. When last we saw the inhabitants of Downton Abbey, they were celebrating New Year’s Eve 1925. The film, set to hit theaters in September 2019, picks up not too long after. Hugh Bonne­ville, who plays patriarch Robert Crawley, Earl of Grantham, reveals there will be "plenty of fun and games and thrills and spills that have become the hallmark of the show [with] some historical figures that are quite significantly involved in the story." The actor hopes the movie is not a one-off. "Star Trek must have done seven or eight [films]," he notes. "Surely we can!" The series-to-film adaptation will be released next year. Get ready for some F-bombs! HBO’s critically acclaimed — and notably profane — 2004–06 Western drama is finally in production on a reunion film, with stars Ian McShane (saloon owner Al Swearengen), Timothy Olyphant (Sheriff Seth Bullock) and many more on board. 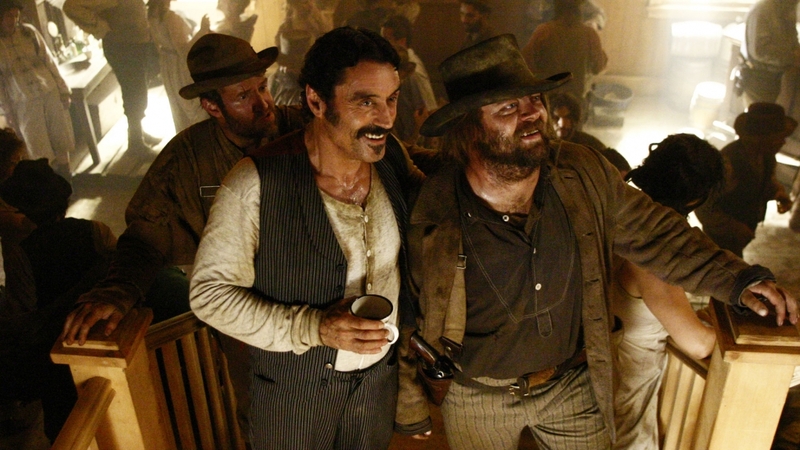 The announcement of more Deadwood was particularly sweet for fans clamoring for closure after the drama’s abrupt cancellation. Written by series creator David Milch, the movie, which went into production earlier this fall, picks up 10 years after the series’ finale. Notes an HBO release, "former rivalries are reignited, alliances are tested and old wounds are reopened." The plot, the cast, the premiere date, and more details for the long-awaited project. According to the logline, Greenbrier "tracks the escape of a kidnapped man and his quest for freedom." Could that be Jesse Pinkman (Aaron Paul), last seen in the series finale driving away to who knows where after the death of his partner in crime, meth overlord Walter? Could White return via flashbacks? Is it a prequel? We are so jonesing for this!